Let the bacon cook until it has rendered some fat and begun to brown a bit, about 7 minutes. Add the onions and sauté until softened and translucent, about 3 more minutes. 2 Stir in the rest of the ingredients and pressure cook: Add the green beans, diced tomatoes and their liquid, water, salt, pepper, cayenne, and thyme. Give everything a good stir so all of the green beans are coated with some of the cooking liquid. It will take about 10 minutes for your pressure cooker to come up to pressure, and then the 7 minutes of actual cooking will begin. 3 Release the pressure: Perform a quick pressure release by immediately moving the vent from “Sealing” to “Venting” (be careful of the steam!). The pot will take a couple minutes to fully release the pressure. 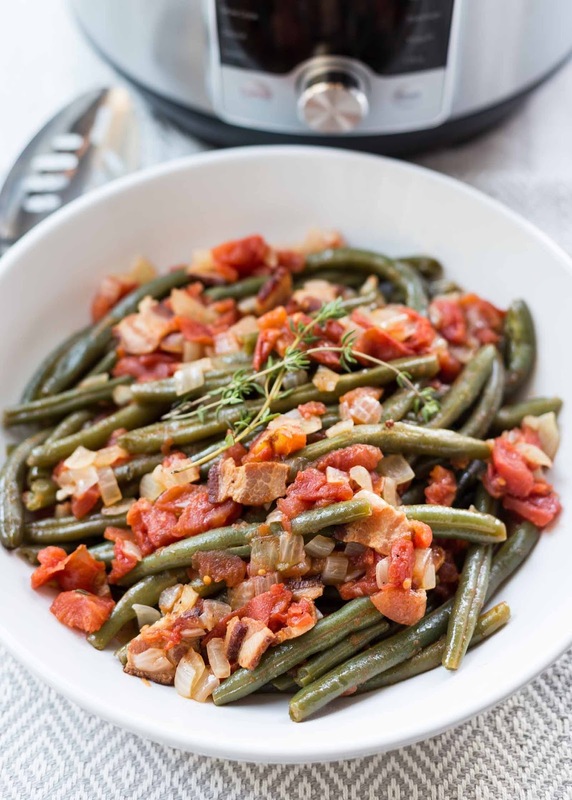 4 Serve the green beans: Use a slotted spoon to gently transfer the green beans to a serving dish. Scoop up the tomatoes, bacon, and onions, and spoon them over the top of the beans. Serve hot.